If you’re familiar with Los Angeles – whether you’ve lived there, traveled there or simply dealt with people from there – you are probably aware that there is an infinite amount of musical resources to be explored over there. There are thousands of musicians, thousands of bands and just as many engineers, singers, conductors, promoters and producers. It can be very confusing when you’re trying to find the one person that can help you with one particular project. There are so many pianists, so many singers, so many studios, so many everything! However, since I’ve had to deal with a lot of people in the LA music bubble lately, I’ve realized one thing: everybody is a “producer”. And I mean everybody. It’s almost an honorary title at this point. But really, what is a producer? And what isn’t? Okay, sure. If I sing hip-hop and need beats, this guy can hook me up. Now let’s look at what he’s saying a bit closer. He’s a producer and he apparently has what it takes to make you a star – somehow he’s not really saying anything about what he has and can offer you that anybody else doesn’t. But wait – this is just one ad, it’s not like I’ve had any discussion with the guy, so I can’t discredit him right away. Unfortunately, I’m familiar with how this goes and for this reason I’m not even going to give him the benefit of the doubt. I’ve heard of horror stories from singers who worked with those so-called producers. Apparently, according to a sadly growing number of individuals in LA, a producer is a guy who can create beats on his GarageBand or Logic software but has little to no actual musical knowledge. 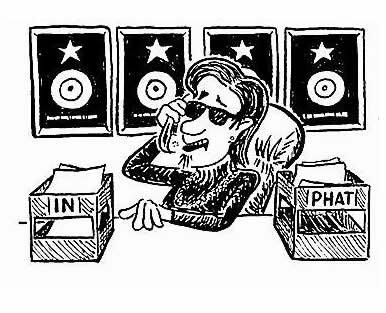 If you’re a musician – whether you play an instrument or sing – or are in a band, you’ve probably looked into working with a producer at some point. It’s very easy to fall for a scam. Someone tells you they have the industry contacts you need and have all the gear to make you sound like a million bucks. But really, is that what a producer does? No. That’s what someone who wants your money does. Think George Martin. The guy is unarguably one of the most famous and talented producers to ever grace the surface of our planet. Martin didn’t use fancy equipment or pride himself in being able to craft a “beat”. He didn’t pride himself in having the right contacts to help a band elevate themselves to a new level. He did however pride himself in having an excellent musical knowledge, being able to play various instruments extremely well and knowing what sounds good and what doesn’t. He could arrange, orchestrate and record anything that was needed. Can your fancy LA producer do that on his GarageBand? The bottom line is, if you’re going to hire a producer – and if you really think you really really need one (because you can do without for now!) – look closely into this person’s background, experience, training and credentials. You don’t want to waste your time, your money and your energy working with someone who doesn’t understand what you want and doesn’t have the knowledge to make it happen for you. A producer isn’t your PR person or your manager – don’t hire someone because they can make you hit it big. Hire someone because they have expertise that will make you sound 10 times betters and improve your songs in whole different way. Exactly, FL Studio.. They seem to think it's the Holy Grail of music production. Ableton on the other hand is real quality.